The following below is a video containing a video clip of Winter, photo montage from my visit to CMA along with some updates on Clearwater Marine Aquarium around 5:30 into the video. For those who may not want to watch the video because it’s long, well, I will give you the news on this post right now. 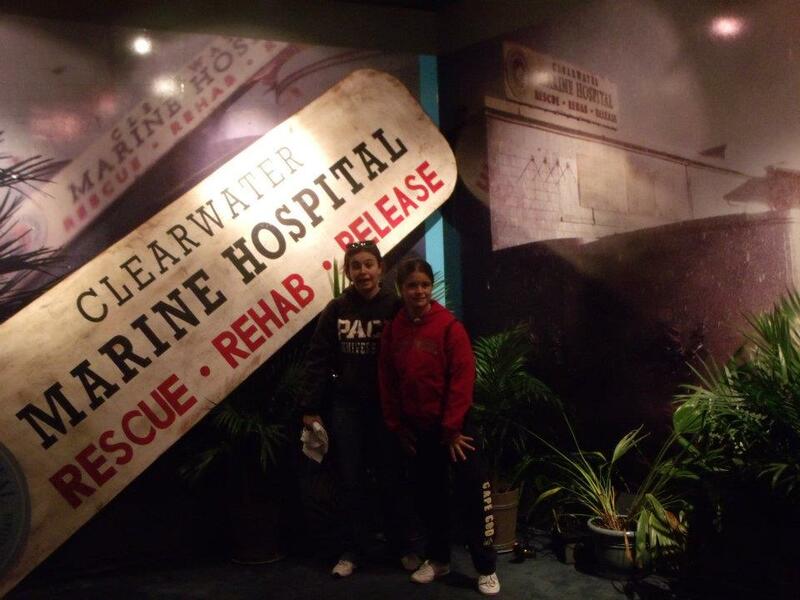 Janis and I are experiencing a "hurricane" at Winter's Dolphin Tale Adventure which is located in downtown Clearwater. Clearwater Marine Aquarium has a new facility that is located in downtown Clearwater. The museum, appropriately named “Winter’s Dolphin Tale Adventure” is the only movie museum in the entire world that’s dedicated to displaying props, recreated scenes and costumes from the movie “Dolphin Tale”. These props includes the real-life movie touch tank where you can meet and touch the real life resident critters of the pool and Winter’s real life prosthetic tails from the six years she has been at CMA. I have personally got to visit this museum and believe me, the staff and volunteers did a really great job putting this amazing museum together. You can get there by taking a trolley that back and forth from CMA to the museum. It’s a really nice place to visit for anyone who loves “Dolphin Tale”, Winter the Dolphin, or CMA in general. 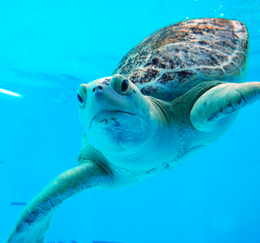 You can now see Bailey the Green sea turtle at the Dolphin Deck exhibit (the pool that was used to film certain scenes with Winter during the filming of "Dolphin Tale"). Photo by CMA. Bailey, a paralyzed green sea turtle has been moved to the Dolphin Deck exhibit to fill the exhibition void that was left behind by bottlenose dolphin Hope when she was moved to the Winter Zone exhibit earlier this month. There, he will have enough room to swim around and receive therapeutic sessions from his care takers after living in the Turtle Cove exhibit for many years. He loves to hang around at the windows to check both himself and the public out. So, the next time you visit Clearwater Marine Aquarium, be sure you check Bailey out at his new home in the Dolphin Deck exhibit. You are never too young to save sea life (photo by CMA and the Davies Family). In lieu of of birthday presents, five year old Lucian Davies had birthday and New Year’s Day party guests donate specific items that would be useful to care for sick, injured, and orphaned dolphins, sea turtles and otters who come to the Clearwater Marine Aquarium for rehabilitation purposes. The youngest has managed to collect 1,683 items including towels, zip-lock bags, dish-washing liquids, and sponges. They were delivered to Danielle O’Neil, director of the marine turtles programs at the Clearwater Marine Aquarium last week. Great job Lucian and keep up the great work! :-). 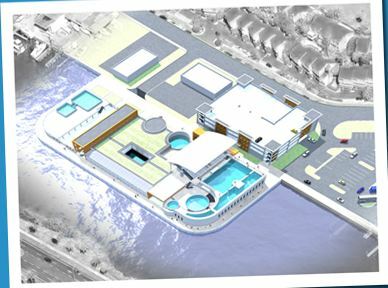 A bird's eye view of what Winter the dolphin's new home would look like once it's complete (photo by CMA). Clearwater Marine Aquarium has so far raised $3 million for their expansion project that would include a new home for Winter and her dolphin family. However, while construction has already started on the new facility, they still need to raise nine more million dollars in order to reach their $12 million goal. 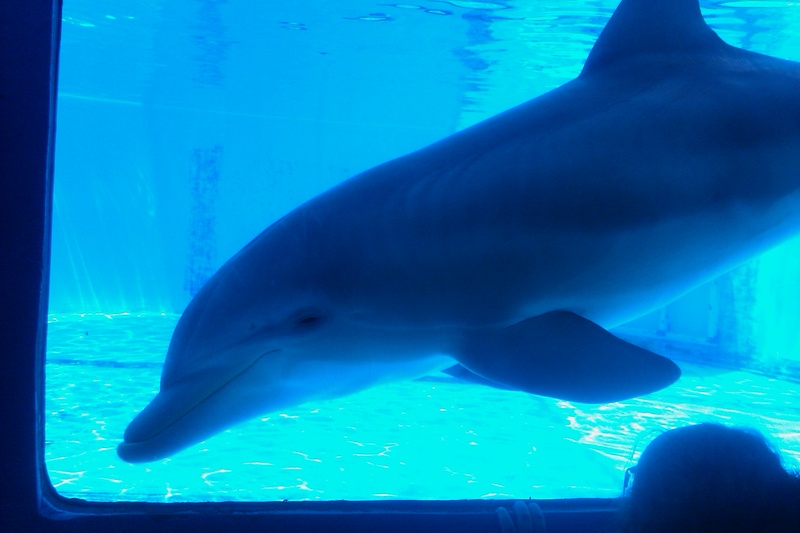 To learn more about how you can donate to the project, visit http://seewinter.com/get-involved/support-the-mission/ride-the-wave-capital-campaign and your donations will help both the animals at the aquarium and the project. I hope you all have a great evening everyone and take care. Merry Christmas Everyone and may you all have a Happy New Year too. I hope you all got the chance to see Winter and her friends at the Clearwater Marine Aquarium this year and may you all get that same chance next year too. SeaWorld is more than just a marine park......It does it part, like many other zoological facilities to help wildlife and educate the public about them. The recent tragedy at SeaWorld, beyond the grieving of a community over a whale trainer’s death, has stimulated discussion about captivity. Anti-captivity groups have called for the release of Tilikum and the end of SeaWorld. They have likened the most advanced zoological facility in the world with prison and named SeaWorld, and in effect all U.S.-permitted and fully accredited zoological institutions, as money- hungry profit-mongers. However, monetary interest in captive animals is not exclusive to zoological parks. The groups calling for Tilikum’s release raise money on the same public display of animals. Their business model is well-refined: They raise more in donations with the least cost of marketing on captive dolphin and whale issues than any other single issue. Is profit a dirty word when it comes to conservation? Studies on environmental movements have linked conservation to prosperity. They reveal that we concern ourselves with conservation only after our basic needs are met, i.e. when we are prosperous. As individuals, we intuitively know this to be true. Zoological institutions are no different than individuals in regard to the relationship between conservation and prosperity. As a professional community, zoos and aquariums have funded more than 3,700 conservation projects in more than 100 countries and spend nearly $70 million each year on conservation initiatives, according to the Association of Zoos and Aquariums. This is possible not only because they possess the knowledge, but because they have the financial capacity. In contrast, anti-captivity nonprofit organizations don’t spend enough on helping animals or their ecosystems. They do not pay taxes on the money they raise, and a large percentage of their proceeds go to salaries, advertising and lobbying activities. Who is the more responsible corporate citizen? 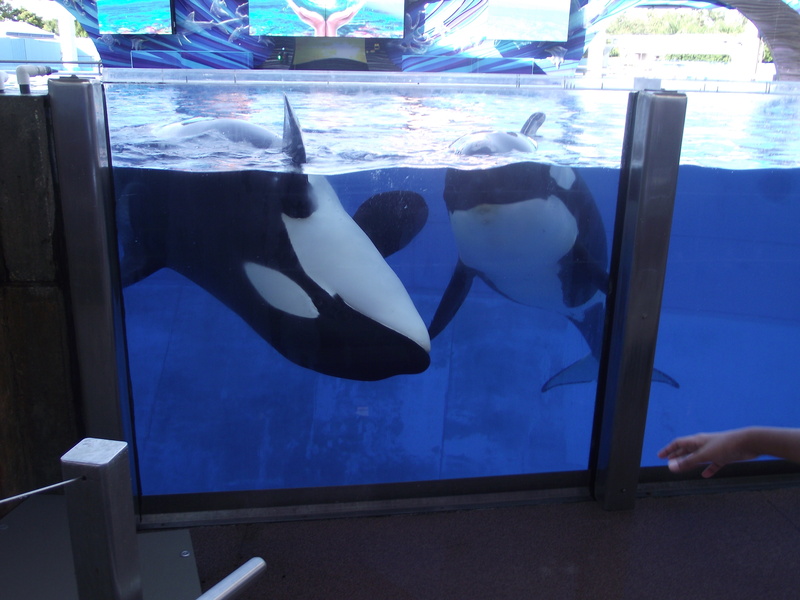 In 1998, Ocean Futures Society, the Humane Society of the United States and Earth Island Institute attempted to release Keiko (of Free Willy notoriety) to the wild. During this release campaign, they raised more than $20 million in tax-free donations and produced several documentary films. As concluded in a scientific report issued by U.S. and Greenland authorities, the Keiko release project was a failure. After only a few weeks on his own, he sought out human contact and exhibited nuisance behavior following boats and looking for handouts. Keiko died of pneumonia in 2003. The experiment was perhaps the most compelling case of animal exploitation in history. The argument against captivity seeks to isolate zoos and aquariums from all other forms of animal use in society. The importance of animals in our society and the plight of quality zoological facilities cannot be so easily reduced to catch phrases like “prison” or “life in a bathtub.” Trainers are not wardens, and the animals are provided the best care in mental, physical, social and environmental stimulation. They are given the highest quality of nutrition and medical care and a clean, hazard-free environment. Conversely, animals in the wild face ever-increasing threats from toxins, depleted food supply and a degrading habitat. They are forced to travel farther and farther to find sustenance. At least 19 species have been saved from absolute extinction by zoological institutions, including black-footed ferrets and California condors. In many tangible ways, SeaWorld and other leading zoological parks are modern-day arks. It has been said that awareness and the emotional motivation to act are the greatest conservation challenges of our time. 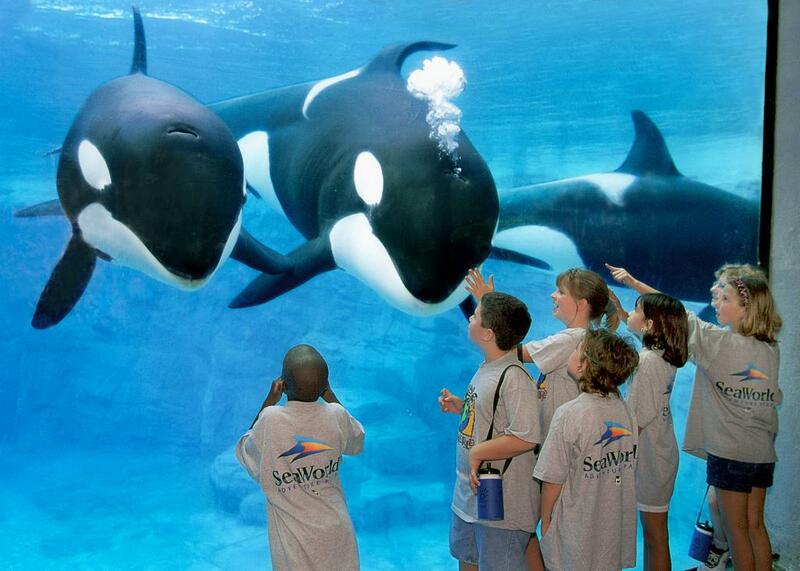 About 175 million people visit zoos and aquariums in the United States every year. When the day comes that the oceans are clean, food sources are abundant and society can act as one in the preservation of wildlife and their ecosystems, then maybe we will not need the constant reminder or the sanctuary that zoos provide. Until then, there are few organizations — for profit or not — that reach as many people and animals as this important social institution. Animals in human care, whether if it's a killer whale, a lion, or lemur, are ambassadors to their wild counterparts. “Keep your eyes open for a lot of upcoming changes…things are about to get crazy! Yet this is an extremely exciting time for us and we so honored to be able to spread the word and educate the world on our mission of rescuing, rehabbing and releasing marine life. We have been making plans to expand our square footage to improve the guest experience. Also, with the West Side construction starting soon we needed to add portable restrooms as our old restrooms are being bulldozed very soon. Adding tents on the North side of the building covered both issues. We are now operational with our new ticket trailers. These will relieve the bottleneck indoors where ticket sales and retail sales had shared the same area. Once our guest purchases a ticket they will walk into the fenced area where a Guest Service Specialist will greet the guest and verify they have purchased a ticket.Once inside the fence the guests are now free to roam the entire guest side of the building and come and go from the building to the fenced area to utilize the restrooms and the activities that the Hospitality team will provide under the tents. Keep in mind that this is not the only current change that is going on right now, the aquarium has also reported that they completed renovation on the sea turtle ICU which re-opened last Monday. This area now has air conditioning, which will keep the turtles cool on the hottest of days, a new drop ceiling with improved lighting, a new glass door, which will allow guests to view the area and two cameras which will serve as “live feeds” for guests to watch the turtles in quarantine pools without having to go into the area. Meanwhile, CMA has recently been only opening up to the public at 1:00 PM due to media interest in the upcoming movie “Dolphin Tale”. 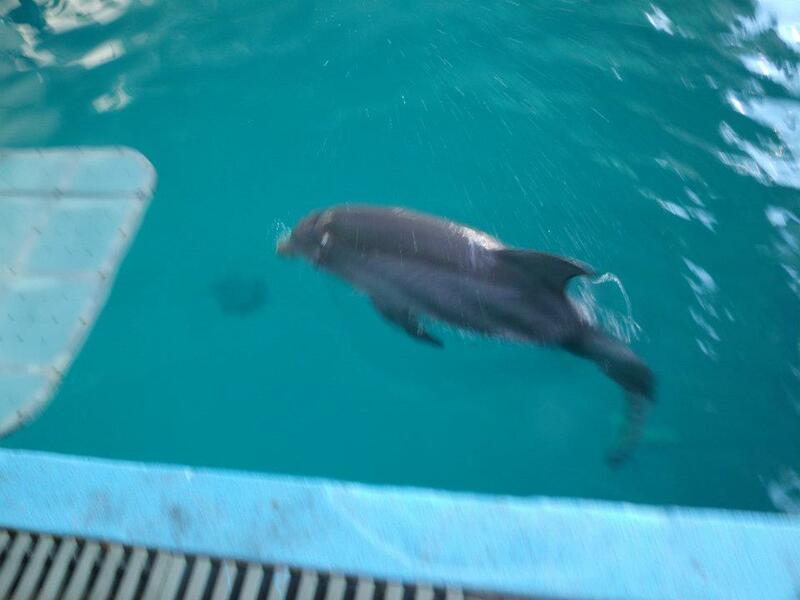 These are all the latest updates on Clearwater Marine Aquarium. Hope you get the chance to visit. Oh, Safe trip and great experience to everyone attending the 2011 IMATA (International Marine Animal Trainer’s Association) conference in Miami, FL this week. I hope you guys have a great experience.